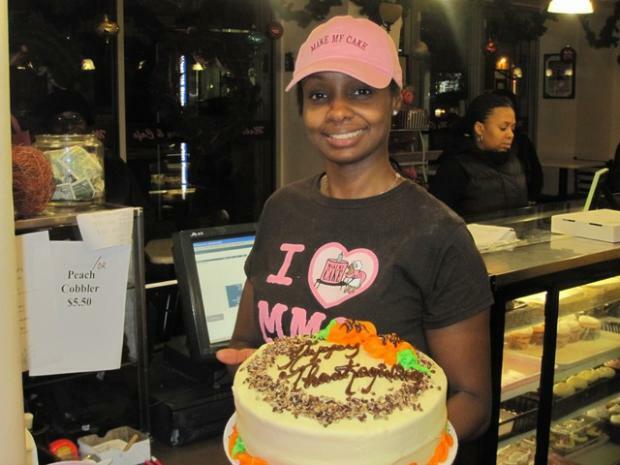 HARLEM — Customers of Make My Cake know that they can satisfy their cravings for sweet potato cheesecake, coconut pecan cookies and red velvet cake at virtually any hour. "I don't post my hours. We close when we close. My clients know that," said Make My Cake co-owner Aliyyah Baylor. She isn't joking. There are no hours to be found on the front door of the bakery and cafe at 116th Street and St. Nicholas Ave, one of two locations in Harlem. Make My Cake is known for their super moist cake and lush frosting, and it's not unusual for Baylor to get last-minute pleas for sweets on her cell phone. To accommodate those last minute customers, Baylor was open on Thanksgiving. "We are supposed to be open from 8 a.m. to 3 p.m. but I'll let my staff go home and I'll stay here until the last pie is sold. It's a community business," Baylor said. So in a way, Baylor said, every day is Small Business Saturday at Make My Cake. Sandwiched in between Black Friday and Cyber Monday, Small Business Saturday is a new national initiative aimed at getting customers to patronize small businesses on the busiest consumer weekend of the year. New York City is the first city in America to proclaim Nov. 27 as Small Business Saturday — though many city residents are unaware of it. Many store owners said neither they or, more importantly, their customers knew anything about the initiative. "I applaud the city for doing different promotions," said Baylor, whose company is featured in a campaign with American Express to promote Small Business Saturday. "I can't see how we can lose. If we get five extra clients conscious of small businesses it will be a benefit." A steady flow of clients crowded the St. Nicholas Avenue location on Thanksgiving eve. Make My Cake's other shop is located on Adam Clayton Powell Jr. Boulevard and 139th Street. Many were aware of the Small Business Saturday initiative and said they support the effort. "Small businesses don't get the support and recognition they need," said Heather Palenschchat, 36, a health insurance analyst for the city who said she often works with small businesses struggling to provide coverage for their employees. "I live in this neighborhood so I try and stop here to support them." Angel Bussue, 43, who works for Adult Protective Services, said she sometimes uses a slice of cake from the shop to make her elderly clients feel more comfortable. "It brings back community to the community because many of the mom and pop shops are all gone," said Busse. Deborah Johnson, 60, who runs her own travel service, said she is drawn to the delicious cakes and pies and was glad to see an African-American owned small business thriving in Harlem. "She's an African-American woman and she needs my business," said Johnson. Make My Cake is a family affair. It started in the home of Baylor's mother JoAnn, the other co-owner, more than 30 years ago. The business grew through word of mouth, with JoAnn Baylor's southern-style creations speaking for themselves. In 1996, the family opened up its first shop on 110th Street and Lenox Avenue, with JoAnn Baylor's children joining her to help run the shop. Today, the business is a well known Harlem institution. Acacia Berry, 28, an archeology student who works the counter at Make My Cake, said Baylor aims to create a comfortable atmosphere for clients. She said customers have told her they enjoyed the safe, cozy vibe and that the shop brightens up the area. "People want to support us. They want to see the local entrepreneur doing well," said Berry. "They come in and see Aliyyah behind the counter making cakes and serving customers and then they see her walking down the street." Being successful has been about developing and maintaining a loyal clientele that can grow as Harlem changes, Baylor said. Even though a steady flow of clients came into the store the day before Thanksgiving, Baylor said the focus is on how to keep her regular clients filing the store while competing with other retailers that sell baked goods, such as local supermarkets. She recently started an online mail order presence and wants to upgrade her delivery van to a delivery truck. But clients like Carlton Nelson, 48, a zoologist who has patronized the Baylor's family's baked goods since they were sold out of JoAnn Baylor's home, are willing to come from Long Island for the red velvet cakes and pies that were served on Thanksgiving. "It's like family here. You know where your roots are," Nelson said.